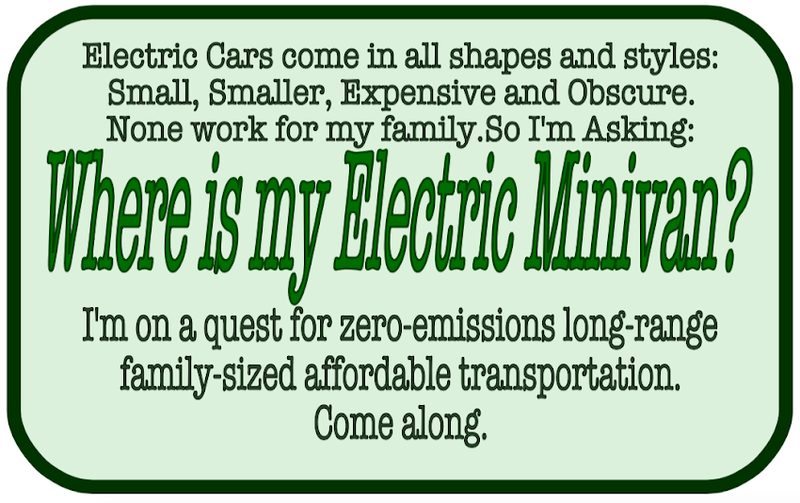 Where is my Electric Minivan? A few weeks ago, we held our third annual National Drive Electric Week event in Liberty Lake. It was a cold, drizzly, breezy day. One reason we like this particular location is that it's next to the Farmers Market. It's a good source of traffic. But with the weather like that, not too many people were at the market. Some people who might have come by to learn about EVs stayed home. Our Tesla Roadster drivers chose to keep their drop-tops in the garage. Car dealerships who've participated before found other things to do. BMW of Spokane continues to be our biggest supporter. Amy Black brought a bright blue 2017 i3. Bridger Price brought an X540e. Both of them are trained BMW Geniuses with plenty to share. NDEW isn't typically a big thing for dealers. Honestly, it's not a great place to sell cars. I have a bit more perspective on that since I've worked in the business. Car dealers prefer to have serious buyers come to them. They don't want to waste their time on people who just want to sniff the paint. Salesmen would much rather not go to off-site events. You may not find one buyer in a thousand people, but you'll spend lots of time saying blah-blah. But BMW is more serious about this electric thing than anyone. Even Nissan, which has more EVs on the road than anyone. Local dealers know nothing and like it that way. They're content to ignore the rare EV customer. Don't tell my Leaf, but I still dream of the i3. If (when) my income makes a leap, I'd rather go i3 than Tesla for my daily commuter. More support for the vehicle and more bang for the buck. I would certainly investigate the used Tesla market before pulling the trigger, though. And the X540e is still the biggest vehicle an ordinary person can find with a plug. I've driven one in the snow and it's rock solid. It has more power than the 3.0 liter gas V6. It will get most people to work and back without burning gas, but you still have a twin-scroll turbo 2.0 in case you need to disappear. I can't wait to see a PHEV or even pure-electric 3 Series. Anyway, I wanted to take a minute to thank the only dealer who showed up on a nasty wet morning to support the cause. They didn't have to, but they did. You can talk about something all day, but sometimes a single demonstration speaks louder. Driving home last night, I see a tuned BMW next to a Hummer at a red light ahead of me. The driver is revving his boosted German engine. "Please let me get a chunk of that BMW," I say to myself. The light turns green and the BMW pulls away from the Hummer. I maneuver into the left lane behind it as we approach a windy uphill stretch of road. I shift from ECO to D and stab it. I pass him on the right and scoot through the 30 MPH curves at over sixty. After a few curves and half a minute he's a block behind me. I stop at the next red light and he eventually catches up. The light turns green before he gets there. He's going about fifteen and he punches it. From a dead stop I keep up with him, then back off the accelerator because I actually don't like driving double the speed limit. He comes to the next light and waits to make a left turn. I'm going straight. He revs the engine and his passenger rolls down the window. I roll down mine. "Vroom," I say, because my engine doesn't rev. "Man, you were flying. Is that all electric?" "A hundred and seven." I explain the low center of gravity because of the battery and the instant torque. His buddy was pretty stoked. The lights turned green and we split up. My point was proven. It was a 2000-something 3 Series with aftermarket suspension and engine mods. The sort of machine a young guy works hard to afford, buy parts for and modify. I couldn't tell much more about it. I went by too fast. Hopefully the dude in the passenger seat is looking for a car. I made both of them think. There are more ways to power a car than only with fossil fuels. And electric is not only clean and economical. It's fun. You'll never get people to go alternative-fuel without giving them performance. The old generation of gear-heads were rebuilding carburetors and reboring cylinders. This generation is tweaking intakes and exhausts in their chipped turbo compacts. The next generation will be ripping the guts from ICE cars, programming controllers and perfecting battery technology. I had to give my 2011 Nissan Leaf a kiss on the steering wheel. She's is the ultimate sleeper. Quiet under any conditions, but when you're sitting behind your gas engine, you hear nothing. You just see a pearl white blur. To the young guy putting the doors back on his BMW this morning: That was fun. Keep working with cars and keep an open mind. And if you're looking for something quick, consider one of these. Remember, the 2011-12 models have more torque than 2013 on. Please drive safe out there. Respect the speed limit and don't hit anything. I only drive fast because I'm an EV evangelist and the road is my church. I launched this site about a year ago as a way of promoting National Drive Electric Week. I was a guy who started writing about electric cars at the end of 2014 and bought a 2011 Nissan Leaf in March of 2015. I was a fan of the cause who became a fan of possibilities. I found the Inland Northwest EV/PV Group and got involved with NDEW. Right before our two events here in Spokane, I started working for BMW. I wanted to spread interest in the technology in general and the i3 in specific. I failed at the actual business of selling cars and soon switched to a Nissan/Ford dealership. I got to work with the new Leaf and Ford's plug-in hybrids. I was disappointed in the trunk of the Fusion Energi but realized I like the C-Max Energi more than I thought I would. Again, I found making money selling cars was too difficult. I have a family, a mortgage and two decades of experience in the restaurant business. In order to earn that all-mighty dollar, I went back to working in hospitality. I'm very happy to be back waiting tables, but I miss one thing. That fifteen mile drive along a windy country back road back and forth to work every day. The drive was a blast in a car that is quick off the line and rock solid around corners. I drove, and still drive, every day like I have something to prove. And I prove it well. The 2011 Leaf is the original and best. It disappears from a green light better than almost everything on the road. With the battery in the floor evenly spread from wheel to wheel, the balance is exceptional. I take corners like a monster. While I regret the slim-income months I spent attempting to sell cars, I appreciate the experience I had driving many other vehicles. I found 300 horsepower twin-turbo BMWs to be sluggish compared to what I drove home. Plus, my car never feels like it's working hard. Put the hammer down in an ICE powered car and you get the feeling you shouldn't drive like that all the time or you'll break your machine. My car? It loves it. Slow or fast, it always feels effortless. Maybe I'll wear my tires out a little quick, but the powertrain is so mechanically simple I'm sure it will go forever. I love driving every day. You have to drive, so you'd better enjoy it. Most people have to spend a bunch on a machine, maintenance and gas to have fun. Not me. My car cost me under $12,000 and has enough change in the center console to fuel it for a month. I had a chance to drive the 2016 Leaf at work then drive my 2011 home. Was it my imagination, or was my old one faster than the new one? Not at all. Check the stats. The 2013 model dips from 215 pound-feet of torque to 187 while keeping 107 horsepower. I'm not a mechanic or engineer, but Nissan must have changed the gearing. It's the same trick that gives the Chevy Spark EV 400 pound-feet with no more horsepower. Now, the newer Leaf has a 30 kWh battery for more range while weighing about the same as my car. It's up to you if you need the range. Mine takes me everywhere I want to go in a day. And everywhere I go, I go fast. More thoughts to come. National Drive Electric Week is coming and I have that feeling. David Klenda, also known as Eighty Six, is a poet, fiction writer and freelance journalist. Apparently, he's also an environmentalist. As a lingual mercenary, word mule, pen for hire, or whatever you want to call it, he'll write about anything you pay him to write. He picked up a job to describe the Lotus Ethos Concept. The client was building a green car website, liked his work and hired him for more. The best part about freelance writing, Mr. Six often says, is being paid to learn. He jumped into green cars. He read up on battery technology, Elon Musk, methods of hybridization, EV converters, solar power and everything else on the topic. He watched "Who Killed the Electric Car", becoming disappointed that the green car revolution of the 1990s died so quickly and quietly. Overall, he was encouraged to see the automobile industry was finally moving away from fossil fuels in the 21st century. 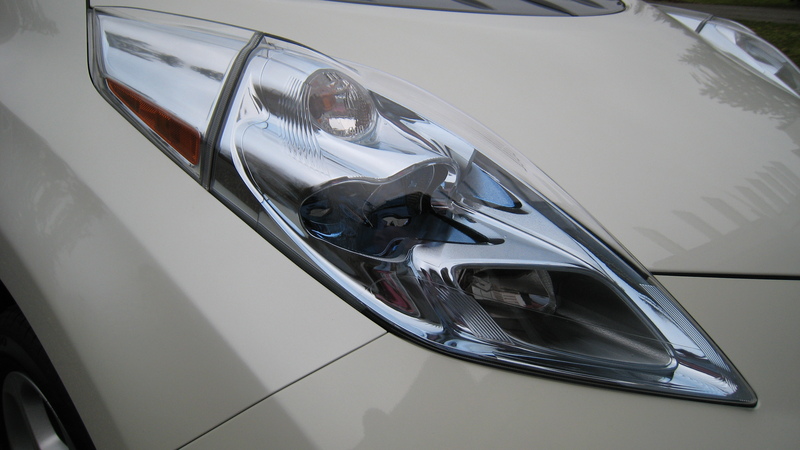 He covered numerous vehicles and topics for Best Green Cars . Almost every car was too small, too expensive, available only in California as a compliance item, did not yet exist, or may never exist. All he wanted was something that would carry his family without exhaling pollutants. Researching what an ordinary person could find and afford, he realized used Nissan Leafs were holding their value poorly. Bad news for the first owner, but was this good news for the used car shopper? He purchased a 2011 model with 23,000 miles for just under $12,000 and loves it. It takes him to work, can ferry around up to two of his kids, gets off the line faster than most cars, can haul significant amounts of groceries and even transported all of his triathlon gear. But for his wife and all three kids, he still must burn gas in a minivan. Hence the point of this whole site. Where is an electric minivan a regular family can afford? For any money, the right vehicle still does not exist, but a number of manufacturers are coming close. Thanks for joining him on the quest for the elusive electric minivan. Follow him here, on Facebook, on Twitter or email him at daklenda at yahoo dot com.